The Challenger Division offers boys and girls ages 4 to 18 with physical and/or mental challenges the opportunity to participate in an organized game of baseball. Those over 18 and still in a program at school are welcome to continue on helping the Challenger Division as a buddy. The fundamental goal of the division is to give everyone a chance to play. A buddy is assigned to each Challenger Player and will be a boy or girl at least 11 years old. The buddy is either a player from Coventry Little league or a volunteer from within the local community. The buddy is responsible for playing side by side with the Challenger Player and assisting them throughout the game. Activities include helping them play in the field, talking to them in the dugout, helping them hit, helping them get around the bases, and talking about the game after it is over. Players receive team hats and uniform shirts, as well as reasonable accommodations to facilitate play. Where/when are the games played? The games are played on the regulation baseball fields of each of the participating Little Leagues in District 3. Challenger games are typically played one day during the week from May to July. This will depend on a variety of factors. The goal is to play at least 6 games during the season. 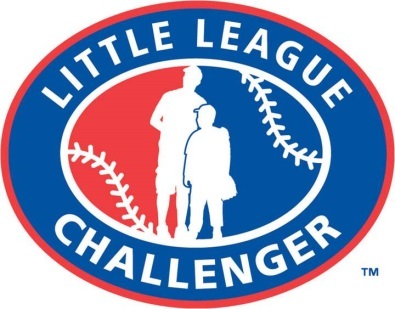 Coventry Little League does not charge registration fees for the Challenger Division. We use funds generated from our Sponsorship and Fundraising Committee to make this possible. Absolutely! The easiest way to help is by spreading the word about the Challenger Program. Assistance will be needed in the coordination of a variety of activities to help the program grow and succeed. If you would like to volunteer, contact any board member to see what opportunities are available to support the Challenger Divisions.